Scientists said the sighting is unusual and the sharks likely come to the area to warm up. At least 10 great white sharks were spotted swimming off the coast of Capitola Tuesday. Scientists said the sighting is unusual and the sharks likely come to the area in the afternoon to warm up. It also believed the great white sharks are in the area due to El Niño. "Last year was the first year they started coming here in great numbers," said Giancarlo Thomae, a marine biologist. "And with this El Niño they are heading 100 miles north where it's warmer." 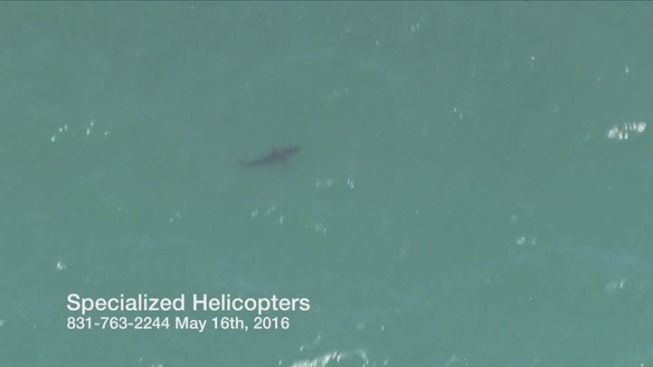 On Tuesday, scientists, including one from the Pacific Shark Research Center flew on a helicopter out of Watsonville to get a birds eye view of the sharks. The sightings of the sharks are a concern to some residents. "That's a lot of sharks and I worry about my kids," Capitola-resident Dana Bartlett said. "But the ocean is their home so you should expect that." Scientists said the great white sharks can grow to exceed 20 feet and 3,000 pounds.